Nice container. Because they need it to protect such impressive stories as this. [The portals] have made assumptions about using our content which are wrong, and we are prepared to demand appropriate compensation. Thomson Reuters and other news agencies have begun working with third-party content identification firms such as Attributor to track the flow of their material across blogs, websites and aggregators. [FT] Any time you talk about a tracking system, the thrust of [the commentary] is about enforcing copyright. But what we hope is the outcome out of this is the ability to enable more licensed uses of content. We want to keep the content open, we don’t want to keep it behind firewalls. What we are building here is a way for good journalism to survive and thrive. 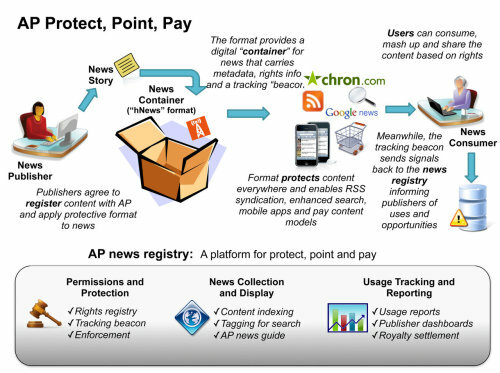 The AP news registry will allow our industry to protect its content online, and will assure that we can continue to provide original, independent and authoritative journalism at a time when the world needs it more than ever. Any time you talk about a tracking system, the thrust of [the commentary] is about enforcing copyright. But what we hope is the outcome out of this is the ability to enable more licensed uses of content. We want to keep the content open, we don’t want to keep it behind firewalls.